Explain when relativistic velocity addition should be used instead of classical addition of velocities. 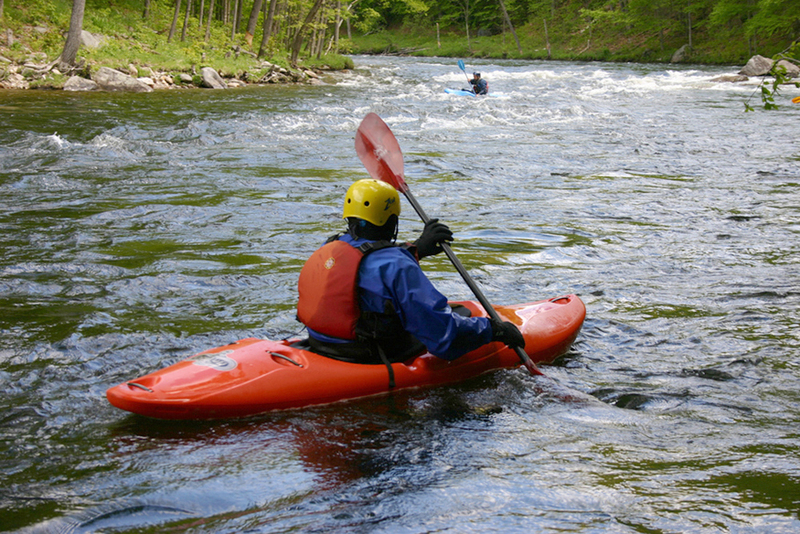 If you’ve ever seen a kayak move down a fast-moving river, you know that remaining in the same place would be hard. The river current pulls the kayak along. Pushing the oars back against the water can move the kayak forward in the water, but that only accounts for part of the velocity. The kayak’s motion is an example of classical addition of velocities. In classical physics, velocities add as vectors. The kayak’s velocity is the vector sum of its velocity relative to the water and the water’s velocity relative to the riverbank. For simplicity, we restrict our consideration of velocity addition to one-dimensional motion. Classically, velocities add like regular numbers in one-dimensional motion. (See Figure 2.) 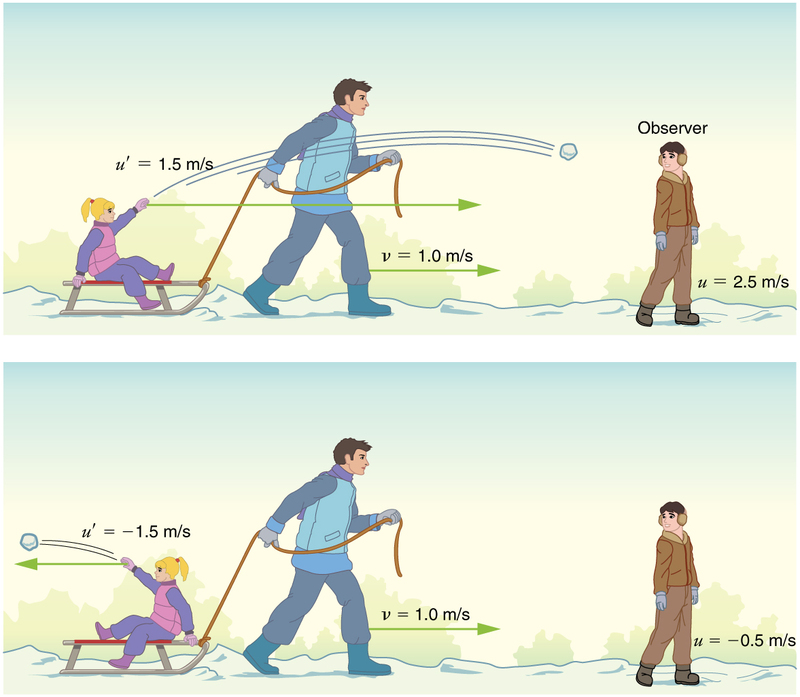 Suppose, for example, a girl is riding in a sled at a speed 1.0 m/s relative to an observer. She throws a snowball first forward, then backward at a speed of 1.5 m/s relative to the sled. We denote direction with plus and minus signs in one dimension; in this example, forward is positive. Let be the velocity of the sled relative to the Earth, the velocity of the snowball relative to the Earth-bound observer, and the velocity of the snowball relative to the sled. Figure 2. Classically, velocities add like ordinary numbers in one-dimensional motion. Here the girl throws a snowball forward and then backward from a sled. The velocity of the sled relative to the Earth is v = 1.0 m/s. The velocity of the snowball relative to the truck is u′, while its velocity relative to the Earth is u. Classically, u = v + u′. Thus, when the girl throws the snowball forward, . It makes good intuitive sense that the snowball will head towards the Earth-bound observer faster, because it is thrown forward from a moving vehicle. When the girl throws the snowball backward, . The minus sign means the snowball moves away from the Earth-bound observer. The second postulate of relativity (verified by extensive experimental observation) says that classical velocity addition does not apply to light. Imagine a car traveling at night along a straight road, as in Figure 3. If classical velocity addition applied to light, then the light from the car’s headlights would approach the observer on the sidewalk at a speed . But we know that light will move away from the car at speed relative to the driver of the car, and light will move towards the observer on the sidewalk at speed , too. Figure 3. According to experiment and the second postulate of relativity, light from the car’s headlights moves away from the car at speed c and towards the observer on the sidewalk at speed c. Classical velocity addition is not valid. where is the relative velocity between two observers, is the velocity of an object relative to one observer, and is the velocity relative to the other observer. (For ease of visualization, we often choose to measure in our reference frame, while someone moving at relative to us measures .) Note that the term becomes very small at low velocities, and gives a result very close to classical velocity addition. As before, we see that classical velocity addition is an excellent approximation to the correct relativistic formula for small velocities. No wonder that it seems correct in our experience. Suppose a spaceship heading directly towards the Earth at half the speed of light sends a signal to us on a laser-produced beam of light. Given that the light leaves the ship at speed as observed from the ship, calculate the speed at which it approaches the Earth. Because the light and the spaceship are moving at relativistic speeds, we cannot use simple velocity addition. Instead, we can determine the speed at which the light approaches the Earth using relativistic velocity addition. Relativistic velocity addition gives the correct result. Light leaves the ship at speed and approaches the Earth at speed . The speed of light is independent of the relative motion of source and observer, whether the observer is on the ship or Earth-bound. Velocities cannot add to greater than the speed of light, provided that is less than and does not exceed . The following example illustrates that relativistic velocity addition is not as symmetric as classical velocity addition. Because the canister and the spaceship are moving at relativistic speeds, we must determine the speed of the canister by an Earth-bound observer using relativistic velocity addition instead of simple velocity addition. The minus sign indicates velocity away from the Earth (in the opposite direction from ), which means the canister is heading towards the Earth in part (a) and away in part (b), as expected. But relativistic velocities do not add as simply as they do classically. In part (a), the canister does approach the Earth faster, but not at the simple sum of . The total velocity is less than you would get classically. And in part (b), the canister moves away from the Earth at a velocity of , which is faster than the you would expect classically. The velocities are not even symmetric. In part (a) the canister moves faster than the ship relative to the Earth, whereas in part (b) it moves slower than the ship. Although the speed of light does not change with relative velocity, the frequencies and wavelengths of light do. First discussed for sound waves, a Doppler shift occurs in any wave when there is relative motion between source and observer. The observed wavelength of electromagnetic radiation is longer (called a red shift) than that emitted by the source when the source moves away from the observer and shorter (called a blue shift) when the source moves towards the observer. Notice that the – and + signs are different than in the wavelength equation. If you are interested in a career that requires a knowledge of special relativity, there’s probably no better connection than astronomy. Astronomers must take into account relativistic effects when they calculate distances, times, and speeds of black holes, galaxies, quasars, and all other astronomical objects. To have a career in astronomy, you need at least an undergraduate degree in either physics or astronomy, but a Master’s or doctoral degree is often required. You also need a good background in high-level mathematics. Suppose a galaxy is moving away from the Earth at a speed . It emits radio waves with a wavelength of . What wavelength would we detect on the Earth? Because the galaxy is moving at a relativistic speed, we must determine the Doppler shift of the radio waves using the relativistic Doppler shift instead of the classical Doppler shift. Because the galaxy is moving away from the Earth, we expect the wavelengths of radiation it emits to be redshifted. The wavelength we calculated is 1.70 m, which is redshifted from the original wavelength of 0.525 m.
The relativistic Doppler shift is easy to observe. This equation has everyday applications ranging from Doppler-shifted radar velocity measurements of transportation to Doppler-radar storm monitoring. In astronomical observations, the relativistic Doppler shift provides velocity information such as the motion and distance of stars. 1: Suppose a space probe moves away from the Earth at a speed . It sends a radio wave message back to the Earth at a frequency of 1.50 GHz. At what frequency is the message received on the Earth? With classical velocity addition, velocities add like regular numbers in one-dimensional motion: , where is the velocity between two observers, is the velocity of an object relative to one observer, and is the velocity relative to the other observer. is the observed wavelength, is the source wavelength, and is the relative velocity of the source to the observer. 1: Explain the meaning of the terms “red shift” and “blue shift” as they relate to the relativistic Doppler effect. 2: What happens to the relativistic Doppler effect when relative velocity is zero? Is this the expected result? 3: Is the relativistic Doppler effect consistent with the classical Doppler effect in the respect that is larger for motion away? 1: Suppose a spaceship heading straight towards the Earth at can shoot a canister at relative to the ship. (a) What is the velocity of the canister relative to the Earth, if it is shot directly at the Earth? (b) If it is shot directly away from the Earth? 2: Repeat the previous problem with the ship heading directly away from the Earth. 3: If a spaceship is approaching the Earth at and a message capsule is sent toward it at relative to the Earth, what is the speed of the capsule relative to the ship? 4: (a) Suppose the speed of light were only . A jet fighter moving toward a target on the ground at shoots bullets, each having a muzzle velocity of . What are the bullets’ velocity relative to the target? (b) If the speed of light was this small, would you observe relativistic effects in everyday life? Discuss. 5: If a galaxy moving away from the Earth has a speed of and emits light characteristic of hydrogen (the most common element in the universe). (a) What wavelength would we observe on the Earth? (b) What type of electromagnetic radiation is this? (c) Why is the speed of the Earth in its orbit negligible here? 6: A space probe speeding towards the nearest star moves at and sends radio information at a broadcast frequency of 1.00 GHz. What frequency is received on the Earth? 7: If two spaceships are heading directly towards each other at , at what speed must a canister be shot from the first ship to approach the other at as seen by the second ship? 8: Two planets are on a collision course, heading directly towards each other at . A spaceship sent from one planet approaches the second at as seen by the second planet. What is the velocity of the ship relative to the first planet? 9: When a missile is shot from one spaceship towards another, it leaves the first at and approaches the other at . What is the relative velocity of the two ships? 10: What is the relative velocity of two spaceships if one fires a missile at the other at and the other observes it to approach at ? 11: Near the center of our galaxy, hydrogen gas is moving directly away from us in its orbit about a black hole. We receive 1900 nm electromagnetic radiation and know that it was 1875 nm when emitted by the hydrogen gas. What is the speed of the gas? 12: A highway patrol officer uses a device that measures the speed of vehicles by bouncing radar off them and measuring the Doppler shift. The outgoing radar has a frequency of 100 GHz and the returning echo has a frequency 15.0 kHz higher. What is the velocity of the vehicle? Note that there are two Doppler shifts in echoes. Be certain not to round off until the end of the problem, because the effect is small. 13: Prove that for any relative velocity between two observers, a beam of light sent from one to the other will approach at speed (provided that is less than , of course). 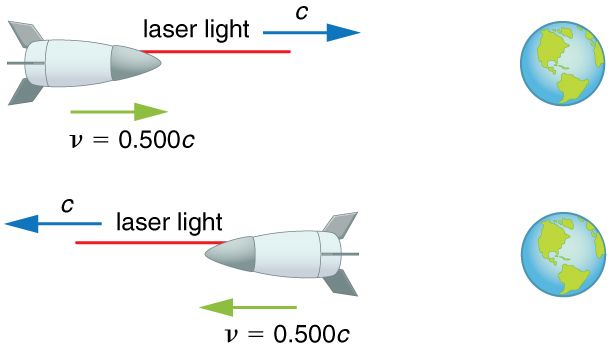 14: Show that for any relative velocity between two observers, a beam of light projected by one directly away from the other will move away at the speed of light (provided that is less than , of course). 28.4 Relativistic Addition of Velocities by OpenStax is licensed under a Creative Commons Attribution 4.0 International License, except where otherwise noted.